It’s time to shift our mindset. Student-centered learning considers how students learn best and what they need to succeed. When this happens, the role of the educator is to learn those needs and design learning experiences accordingly. Here are some tips for helping teachers create student-centered classrooms. Ask for student learning plans rather than lesson plans. Lesson plans show what the teacher intends to do in class. For instance, it might say, “Start off with a slideshow,” or “Give students a writing assignment.” However, students are the ones doing the learning. So instead of requesting lesson plans, ask for student plans. Have teachers share what actions students will be taking during class. Will they be discussing assigned reading? Are students going to be on their feet during an activity? Collaborating on a project? This is an opportunity to flip the focus of school from teaching to learning. Doing so will help you understand just how student centered your classrooms are and identify ways you can help teachers improve in this area. Student plans ensure that we most value and emphasize what the students do. After all, the Latin origins of the word “educate” is “to draw or lead from,” not to fill up. 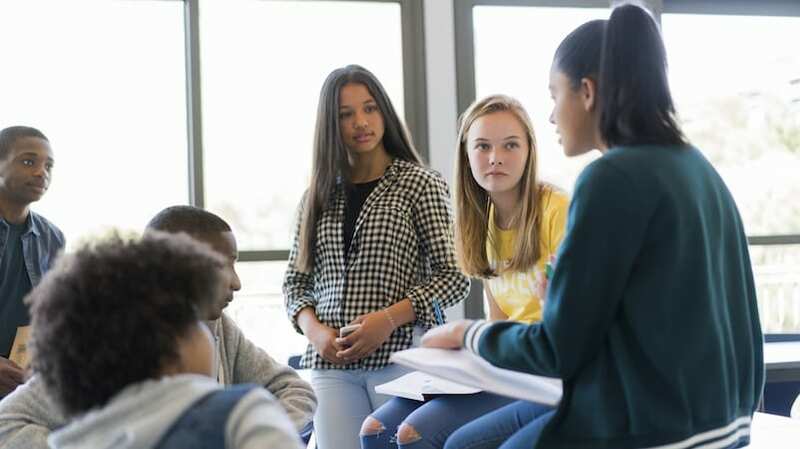 If a plan essentially says that students will be sitting and listening for the duration of the class, it might be an indication that the teacher needs some fresh ideas for engaging students. Of course, teachers should still plan and document their own actions for class. After all, they are the ones facilitating the learning. However, as an administrator, in order to center student learning, you should also be aware of what students, not just teachers, are doing in the classroom. Student plans should include non-content standards too. As Roberta Golinkoff and Kathy Hirsh-Pasek note in their 2017 book, Becoming Brilliant, there are at least 6 elements to learning that help students create meaning. Content is one of them, and so are things like confidence and communication. Their work includes a rubric to use to begin to identify ways to grow in each capacity. A student-centered classroom should have opportunities for students to learn and practice these elements. 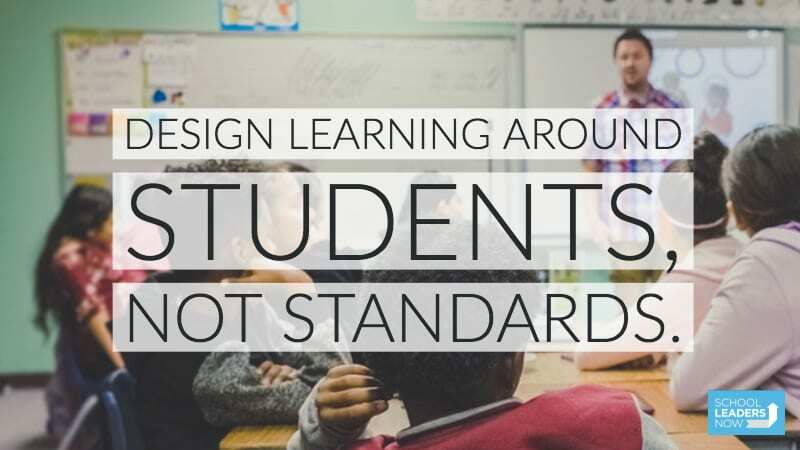 Design learning around students, not standards. Most of the time, learning is centered on a set of content standards and goals we want students to meet. It makes sense. If the goal is to meet standards, why not focus on them? However, students engage so much more when we design learning around them rather than standards. Educators need to know students well enough—their interests, strengths, and goals—to develop a plan for students. Getting to know students can start with using a platform like Thrively to conduct a strengths assessment. Teachers can use this data to begin designing instruction. Good design, whether its for a building, a logo, or an experience, always starts with the person for whom one is designing. This entry point, the hallmark of design, is called “developing empathy.” It’s a way of saying “until I understand you, I can’t design with you in mind.” Empathy can be developed through observation, focus groups, surveys, or even casual conversations. Relationships are at the heart of the work teachers do, and relationships are where empathy begins. Once an educator knows their students’ likes, dislikes, strengths, and weaknesses, they can then create student-centered learning experiences. If a teacher finds that their students love working with their hands, they can incorporate makerspaces or project-based learning into the experience. If there is a certain cause students gravitate toward, teachers can design ways to bring that cause into the learning that is happening. However, this can only occur when teachers first learn about their students. This isn’t to say that subject matter and standards are not important. They just should not be the main emphasis. In other words, instead of creating a plan solely focused meeting standards, teachers should design lessons in a way that will help students meet standards, pique their interests, play to their strengths, and encourage them to grow. When a student’s interests and motivations are considered first, that engagement will carry over, and students will meet learning goals. Discuss the purpose of teachers. Disney calls their theme-park-creation team members Imagineers. “Imagineers bring art and science together to turn fantasy into reality and dreams into magic.” The job title is an attempt to describe what the individuals actually do in their work. Names are the way we make a concept concrete. If staff members changed their job titles to something more reflective of what they do, what would happen? What if they chose “learning designers?” What about using the terms “experience architect,” “storyteller,” or “rule breaker,” as Gallagher and Thordarson note in their work Design Thinking for Educators? If reconsidering job titles seems too much of a stretch, consider just having a conversation about what teaching is—and isn’t. Move from planning what teachers are doing to designing what experiences students will have, based on their strengths and interests. When students become the center of learning, the role of the educator shifts as well. Be intentional about shifting your mindset. As you work together with teachers to move intent from what teachers do to what students do, be patient. Putting new ideas into practice takes time. Go slowly, support your teachers, and celebrate small victories. Remember to keep your teachers’ strengths and interests at the center of the work you do. When you empower teachers and consider what they need, you inevitably empower students. Carol was a teacher for 15 years, a principal for 4, and is currently the Assistant Superintendent at Godfrey-Lee Public Schools.